The Panthers, who finished the season at 2-3, owned wins over Duxbury (55-45) and Silver Lake (54-45) and were clipped by Hingham (57-43) and Pembroke (57-41). Whitman-Hanson Regional High boys’ indoor track head coach Mike Driscoll is pleased with the effort put forth by his team this winter. “With the exception of the Plymouth North meet (70-30 loss), who were the [league] champions, we hung with some really good teams,” Driscoll explained. “We beat Duxbury, we beat Silver Lake, and Duxbury is a really good track team. We got within two events of beating Hingham, which we haven’t done in a long time. The four Panthers to crack the Division 3 All-State meet, which was held Feb. 18 at the Reggie Lewis Track and Athletic Center, were senior captains Brian Edwards and Andrew Newman (Patriot League All-Star) and classmates Brett Holmes (Patriot League All-Star) and Jack Ryan (Patriot League All-Star). Edwards finished the contest tying his career-best of a 6-foot high jump, which was good for eighth place and a medal. Newman also medaled with a seventh-place finish in the 2-mile run at 10:08.66. Holmes and Ryan missed out on medals in the long jump and 1,000-meter run, respectively. The Panthers were also bolstered this season by the addition of indoor track newbie and the progression of a seasoned veteran. Driscoll said Coletti was the biggest surprise of the winter. 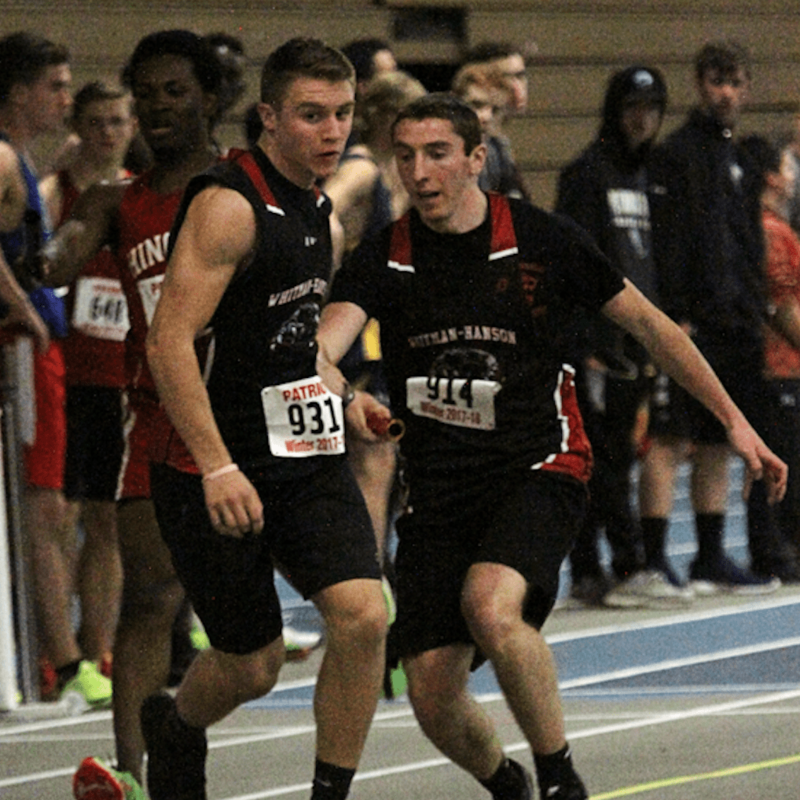 Coletti was a leg on the 4×400 relay team, along with sophomore Kyle O’Brien, Ryan and senior Andrew Tassey, that finished in 3:51.62 to help the Panthers edge Duxbury on Dec. 19. Driscoll said he hopes to continue to develop the indoor track program by attracting more student-athletes over the offseason. Head coach Mike Driscoll has several newcomers on his hands this winter. The Whitman-Hanson Regional High boys’ indoor track team looks much improved from last winter. Why? Well look at the club’s first meet of the season against Hingham. After falling to the Harbormen, 63.5 to 36.5, last December, the Panthers, who finished last season with a 2-3 record, hung tough this time around as they were just edged out, 57-43. Sixth-year head coach Mike Driscoll credits the performances of a few of his seniors — Brian Edwards, Brett Holmes, Andrew Newman and Jack Ryan — as a big reason why they were able to hang around. On the ground, Ryan, who is one of two Panthers captains, raced to a first-place finish in the 600-meter dash with a time of 1:30.45, and was a member of the 4×400 relay team that also took home first. Newman completed the 2-mile run in 10:35.44, which was nearly 30 seconds better than opponent, for the win. Edwards, who is also a captain, spearheaded the Panthers’ high jump with a 5-foot-7 leap, which earned him the top spot. Holmes, a senior and first-time indoor track participant, took his talents to the long jump and he shined with a first-place finish courtesy of a 20-foot-10 ½ jump. Both were on the 4×200 relay team as well. Holmes is one of several newcomers Driscoll said he will be relying on to shore up one of club’s weak spots — sprinting. The Panthers will be back in action on Friday, Jan. 5 at 4:30 p.m. at the Reggie Lewis Track and Athletic Center against Pembroke.